About then, I noticed a huge set of antlers protruding from the knee-high little bluestem and sage. We stopped at a range of about 40 feet, and the buck jumped up and stotted away into the mesquite and cedar. Dee, looking a little guilty, remained steady, awaiting further orders. That’s the way it goes, of course: go quail hunting and see deer; go deer hunting and see ducks; go bass fishing and see turkeys. But the lesson I drew from the encounter was that under some conditions, if not often, mule deer, a quintessential open country big game species, will hunker down like a whitetail and wait for danger to pass. Although we approached from downwind, we couldn’t have surprised him given our talking and whistling to the dogs. Had I been glassing the bottom from the slope south of the river, I might have seen him slipping from his feeding cover to his afternoon bed. Likewise, just before dark, I would’ve seen him rise to begin his nightly business. At that point, depending on range, I would’ve chosen between a long shot or spot-and-stalk to get within range. But if I were a bowhunter or doubted the flat, grassy river bottom provided cover for stalking, I might break with convention and try to pattern that buck and set up an ambush. 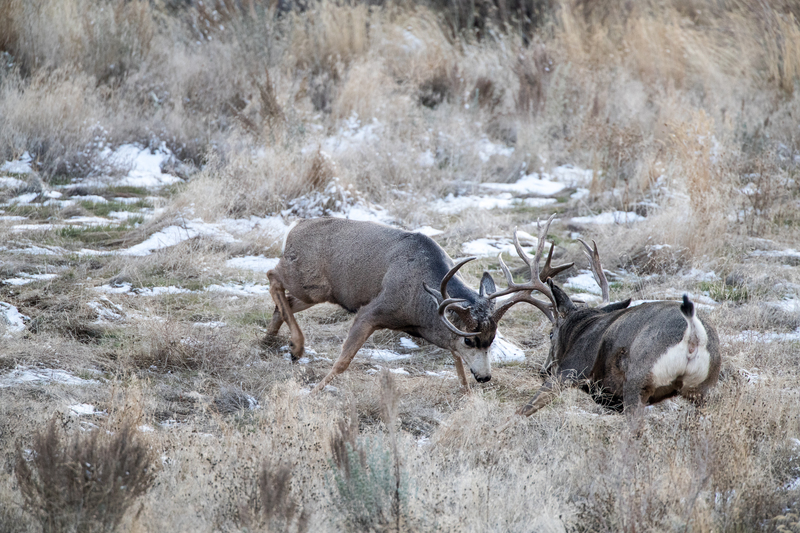 Although mule deer are in general less “spooky” than whitetails, relying on distance and keen eyesight more than scenting ability, heavy cover and extreme wariness, trophy mule deer—bucks at least five years old—will be harder to pattern and stalk than does and young bucks. In Texas, “mule deer” means desert mule deer, a slightly smaller subspecies distinct from Rocky Mountain mule deer native to the Western Mountain States. Although mule deer probably inhabited much of Texas west of the 100th Meridian prior to the frontier era, they’re now limited to the Trans-Pecos and the adjacent western fringe of the Hill Country, and the rough hills and canyons of the Brazos, Canadian, Red and Pease rivers of the Panhandle. Some hunters and biologists have speculated that mule deer in the northern Panhandle are the Rocky Mountain subspecies, but recent DNA studies show a remarkable uniformity over the entire range in Texas—perhaps due to the 1,500 or so desert mule deer translocated from the Trans-Pecos to the Panhandle from the 1950s through the 1970s. While Rocky Mountain mule deer migrate from foothills and plains to higher country for summer and back for fall and winter, desert mule deer tend to live out their lives in home ranges of only a few square miles. 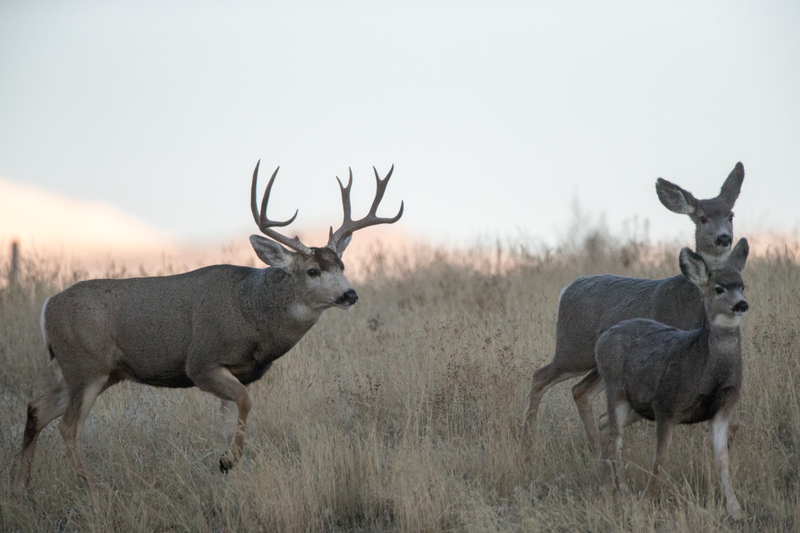 Breeding season—rut—usually begins in November, peaks in mid-December, and may run into February. Fawns are born in July and August after a seven-month gestation period. Does usually breed for the first time at two years of age and have only one fawn. During years of good forage, older does often bear twins. 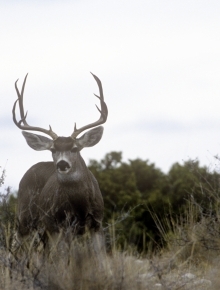 Groups of 20 – 40 mule deer may gather January to March. As their name suggests, desert mule deer make efficient use of moisture and can survive without daily access to water. Still, a shortage of water causes severe stress and inhibits reproduction. During drought, water from windmills and guzzlers are a boon to mule deer survival. Like whitetails, mule deer are primarily browsers. Woody plants, vines and forbs make up most of their diet. At times, they’ll eat succulent, green grass. Domestic browsers such as goats and exotic big game compete with mule deer for forage. Late winter, when forage is scarcest, is the most stressful time of year. Speaking of stress, the Trans-Pecos Region has yet to recover from a historic drought. “In 2011 and 2012, we didn’t have a fawn crop to speak of,” said Shawn Gray, TPWD’s mule deer and pronghorn program leader. Currently, he’s guardedly optimistic. “Numbers should be pretty good this year, but antler development will be below average,” he said. “We’re starting to get more mature bucks in the five to six-year-old range. Gray estimates the Trans-Pecos mule deer population at 153,000; the Panhandle population at 133,000. The average harvest over the past few seasons has about 9,000 deer with a 40 percent hunter success rate. In the eastern Panhandle, whitetails have displaced mule deer as brush encroaches on formerly open grassland. The heavier cover renders the mule deer’s sharp eyesight less effective against predators, mostly coyotes. “It is a trend, but we still have a lot of mule deer over there,” Gray said. For the 2018 season, TPWD implemented antler restrictions in six southeastern Panhandle counties hoping to increase the percentage of mature bucks. Gray and his colleagues are in year four of a five-year study to determine how mule deer use highly fragmented habitat in the Panhandle. The results should help biologists hone mule deer management techniques and better advise landowners. Currently brush control and water development are the two most important mule deer management tools. TPWD’s partners in the study include Texas A&M Kingsville, Texas Tech, Borderlands Research Institute, Mule Deer Foundation, and the Boone and Crockett Club. “The support we’ve received from landowners and hunters far exceeded my expectations,” Gray said. Currently, brush control and water development are the two most important mule deer management tools. All or parts of nine counties in the Panhandle’s northwest corner and the three counties that make up the western third of the Trans-Pecos are designated Chronic Wasting Disease (CWD) Zones. Hunters who harvest a mule deer (or elk or whitetail deer) in a CWD Zone must bring the animal to a TPWD check station within 48 hours. See TPWD’s 2018 Outdoor Annual for details. TWA Member Greg Simons, a wildlife biologist, founder and owner of San Angelo-based Wildlife Systems, Inc., manages mule deer hunts on some 400,000 acres in the Trans-Pecos. In his spare time, he hunts mule deer on a 43,000-acre lease north of Kent, where he has taken three bucks in the 190 – 200-inch class. Simons attributes the difference to a growing number of experienced hunters looking for truly wild country. “These folks come out to big country and they’re not confined to a box blind looking over a feeding station, and they’re hooked,” he said. Contrary to convention, which says that mule deer bucks can’t be patterned like whitetail bucks, Simons places game cameras at watering sites. Simons’ principal hunting method involves glassing and stalking. He’ll start the morning with the sun at his back and stay on a location from 30 minutes to an hour, covering as much country as possible. Patience is key. Early in the season, mature bucks tend to hang out in the flats while the does, fawns and yearling bucks congregate in the hills. The most productive flats usually have plenty of Apache plume, little leaf sumac and hackberry. Although solitary bucks are the norm, they’ll occasionally loaf in bachelor groups. Given adequate moisture, they’ll browse forbs amid creosote. During dry periods, drainage areas hold the best forage and the biggest bucks. Mule deer hunters accustomed to the vast state and federal lands in the Mountain West, where competition from other hunters and their effect on deer behavior are constant realities, often push too hard when they come to Texas. During the hard winter months, when forbs are scarce to nonexistant, sotol and lechuguilla are lifesavers. Once the rut starts, and the big bucks are moving constantly, Simons picks up the pace too, covering large areas in his truck or on an ATV. He never leaves camp without 12x50 binoculars and a spotting scope mounted on a tripod. In his pickup, he relies on a second spotting scope equipped with a window clamp. 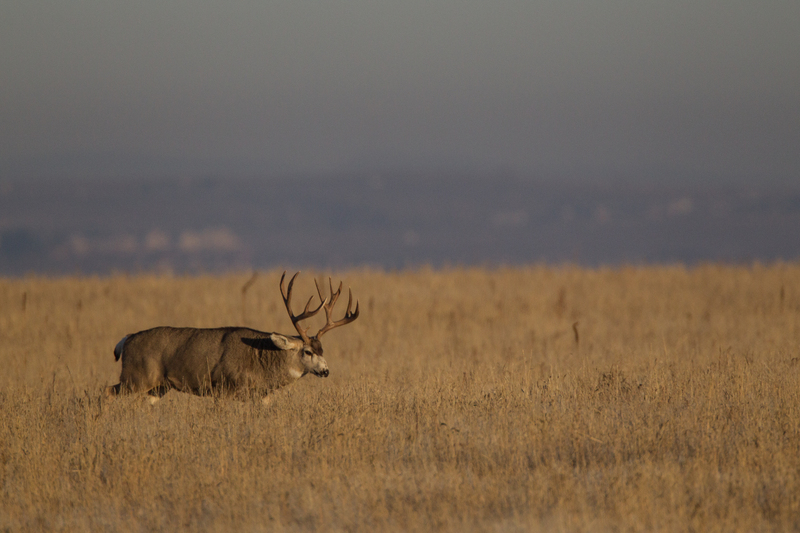 Some of the best mule deer country isn’t exactly easy on the eyes. Although Simons likes his .280, he also recommends .270 or .30-06 with 130 and 150 grain bullets respectively. Although popular with whitetail hunters, the .243 is too light for mule deer. The .25-06 is marginal, even in capable hands. Rapidly expanding ballistic tip bullets are best left for predator hunters. Responsible mule deer hunters count on traditional soft point bullets to provide good penetration with effective expansion. Bucking conventional wisdom again, Simons recommends sighting rifles in dead on at 100 yards instead of the traditional 2-3 inches high to be on target at 250 yards.